Facts & Figures s ABOUT he 19 communities along the Fox River in the greater Appleton, Wisconsin area, known as the Fox Cities offer urban style and activities while still maintaining small-town warmth and affordability. Come for a shopping weekend with the girls; a relaxing couple's retreat loaded with cultural activities, dining and nightlife; or a fun family escape. Central to the Fox Cities' experience is shopping. Fox River Mall features 180 retailers including many national franchises not usually found in a small urban market. Outside the mall, the Fox Cities feature excellent antiques and locally-owned shops in several thriving downtowns. We invite you to get away to the Fox Cities of Wisconsin anytime of the year. This guide is your start to a wonderful visit. For more information, vacation package specials and an up-to-the-minute calendar of events, visit our website at foxcities.org. We hope to see you soon! The Fox Cities are 19 communities located along the Fox River and Lake Winnebago in East Central Wisconsin. The communities are: Appleton, Clayton, Combined Locks, Buchanan, Freedom, Grand Chute, Greenville, Harrison, Hortonville, Kaukauna, Kimberly, Little Chute, Menasha, Neenah, Sherwood, Town of Menasha, Town of Neenah, Vandenbroek and Woodville. POPULATION City of Appleton: 72,623 Metro Area: 250,000 WEATHER SEASONAL MEDIAN TEMPERATURES (°F) Spring: 44, Summer: 70, Fall: 49, Winter: 19 Average annual rainfall: 30 inches Average annual snowfall: 47 inches AIRPORT Outagamie County Regional Airport (ATW) Delta, United, Allegiant newspaper The Post-Crescent TELEVISION Channel 2 5 11 14 26 32 38 Station WBAY WFRV WLUK WIWB WGBA WACY WPNE Afﬁliation ABC CBS FOX CW NBC MyTV PBS RADIO AM 1150 WHBY, News-Talk-Sports 95.3, WSCO "The Score", Sports Talk Radio 94.3 WYDR, Classic AC 105.7 WAPL, Classic Rock 95.9 KISS-FM, WKSZ, All Hit Music 94.7 Razor WZOR, Active Rock 92.9 WXMM, 80's and early 90's KZ104.3 WKGZ, 80's and early 90's The Fox Cities Convention & Visitors Bureau's mission is to strengthen the Fox Cities economy by attracting meeting, sports and leisure visitors through sales, marketing and destination development. foxcities.org | 800-236-6673 Our goal, as a staff, is to provide information to visitors to the Fox Cities, ensuring that they enjoy their time here. We are happy to assist meeting attendees and leisure travelers alike with any information they might need on their visit to the Fox Cities. We are proud of the great hotels, restaurants and attractions and we hope you enjoy your time visiting here! Pictured from left to right: Mary Minten, Matt Ten Haken, Pam Seidl, Kelly Hekler, Kim Tisler, Karen Treml, Mary Hirvela, Jennifer Hecht and Chadd Scott. ©2014 Fox Cities Convention & Visitors Bureau. 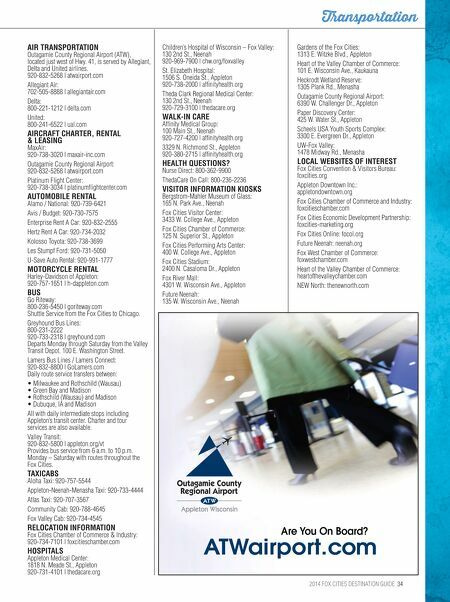 The Ofﬁcial 2014 Fox Cities Destination Guide is published annually by the Fox Cities Convention & Visitors Bureau. 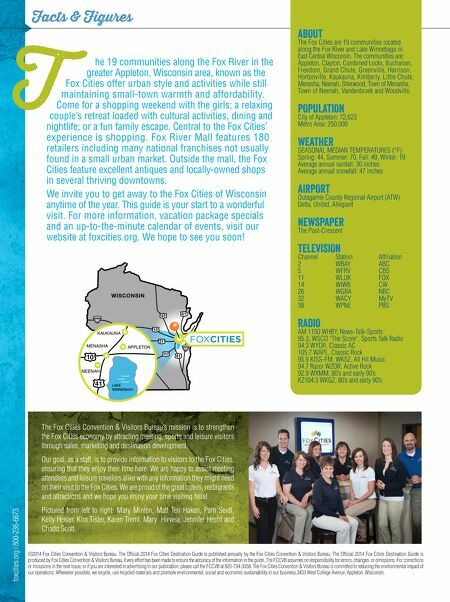 The Ofﬁcial 2014 Fox Cities Destination Guide is produced by Fox Cities Convention & Visitors Bureau, Every effort has been made to ensure the accuracy of the information in the guide. The FCCVB assumes no responsibility for errors, changes or omissions. For corrections or inclusions in the next issue, or if you are interested in advertising in our publication, please call the FCCVB at 920-734-3358. The Fox Cities Convention & Visitors Bureau is committed to reducing the environmental impact of our operations. Whenever possible, we recycle, use recycled materials and promote environmental, social and economic sustainability in our business.3433 West College Avenue, Appleton, Wisconsin.